Local insight to help you plan your next San Diego vacation. 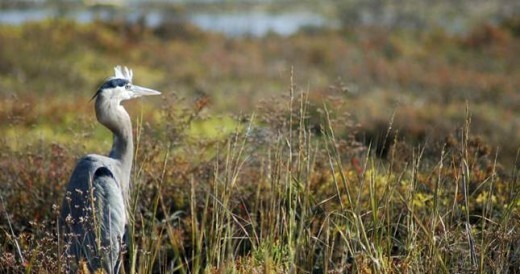 See a Great Blue Heron while Birding in San Diego. With most of California’s wetlands gone and developed, birding enthusiasts should know those wetlands remain here in the San Diego County region serve as the last refuge for many of the Western Flyway’s migrating birds on the way in or back from farther south. That makes San Diego one of the premier destinations for birders from all over the world. As many as 480 bird species have been identified in San Diego County. In addition to this hot spot for birding, the Colorado River and the Salton Sea to the east also are prime bird-watching areas and within a day trip of San Diego. From the shoreline along the coast to the mountains and into the Anza-Borrego Desert State Park, birding areas are becoming more and more popular. In addition to the migratory route, our local mountains have become nesting areas for bald eagles, golden eagles and many other raptors. A bald eagle’s nest along Route 79 near Lake Henshaw a few years back attracted thousands of visitors who pulled off to get glimpses of the eaglets in the nest. At Lake Miramar, a great horned owl’s nest also drew birders daily to see the progress of the owl chicks. Each year in February the San Diego National Wildlife Refuge hosts the San Diego Bird Festival that features field trips to the three coastal San Diego National Wildlife Refuges. This is a great opportunity to join hundreds of other birders on guided trips to areas that hold rare birds like pied-billed grebes and black-vented shearwaters. The San Diego flood channel, often called “San Diego’s Mile Of Birds,” attracts blue-winged teal, ruddy ducks, osprey, gulls, terns, black brant, and cormorants. The flood channel has plenty of access for hiking or biking. In Point Loma, at West Point Loma Boulevard and Famosa Boulevard, the Fomosa Slough is a small tidal marsh that has walking trails, benches and very good birding for waterfowl, shorebirds and other migrating species. Also in Point Loma (1800 Cabrillo Memorial Drive), the 144-acre Cabrillo National Monument features an interpretive center, lighthouse and great views of San Diego Bay and the Pacific Ocean. The area’s tidepools and protected sage scrub habitat are home to many birds such as the wrentit, western scrub jay, California towhee and many more. Pelicans can be seen soaring above the shoreline. Seagulls and other shore birds dot the sand and rocks. Shelter Island is another great place to observe some of the rare species that frequent the area in the winter. Loons, grebes and ducks will raft in some areas of North San Diego Bay. At the western end, surf scooters, bufflehead, auklets and murres often can be spotted. At the Northern Wildlife Preserve and Kendall Frost Marsh in Mission Bay (Crown Point Shores Drive at Lamont), check for skimmers, clapper rails, brant and even the large-billed savannah sparrow. There’s 16 acres of salt marshes and open water that is home to two endangered species, the light-footed clapper rail and Belding’s savannah sparrow. In addition to those birds, there often are swallows, grebes, pelicans and herons. There’s an observation platform to set up for better birding. Farther up the coast off La Jolla (Coast Boulevard off of Prospect Street), the area’s rocky shoreline north of La Jolla cove holds shorebirds like gulls and terns. And the Torrey Pines State Reserve is a great place to visit to see the ancient Torrey pine. Look for peregrine falcons, osprey, swifts, thrashers, woodpeckers and wrentits. At Imperial Beach (Fifth Street and Iris), the Tijuana Estuary and South Bay Refuge, maintained by the U.S. Fish and Wildlife Service, features an interpretive center and 2,500 acres of coastal wetlands. Over 370 species of birds have been documented here, and 320 of them are migratory. In addition to the rare Belding’s savannah sparrow there are the American peregrine falcon, white pelicans, egrets, plovers, sandpipers, jaegers, ospreys, short-eared owls, clapper rails and blue herons. The Dairy Mart Ponds Ecological Reserve (take Interstate 5 South to Dairy Mart Road south) has freshwater ponds that were left by an old salt mining plant. Scan this area for the blue grosbeak, the common moorhen, white pelicans and common yellowthroats. If you don’t mind traveling farther inland, the Mission Trails Regional Park, all of the inland lakes like Lake Murray, Miramar, Lower and Upper Otay, Jennings, El Capitan and others offer great hiking and bird-watching. If you visit Julian, be sure and stop by the Birdwatcher store in town. The store has lots of great birding information, feeders, gifts and books. This entry was posted in Golf & Sports, Outdoor Adventures and tagged audubon, birding, birds, birdwatching, east county, la jolla, mission bay and beaches, north county coastal, south bay by Martin. Bookmark the permalink. Martin Zeralko has been around San Diego fishing, both freshwater and saltwater, for over 30 years. He has fished everything from half-day trips to multi-day trips out of San Diego. On the freshwater side, he has fished every San Diego lake and knows which ones are worth visiting and at what time for the best action. When he's not fishing, he's thinking about fishing or trying to figure out a way to go fishing. I had no idea that San Diego was such a premier destination for bird enthusiasts. Thanks for providing so many great locations to observe these lovely creatures in San Diego. 480 Species?? Wow!